New Delhi : Just After the Union Budget 2015, which was presented on Saturday by Finance Minister Arun Jaitley in Parliament, public got another shock by price of fuel as the petrol and diesel's price hiked Rs. 3.18 and 3.09 per ltr respectively. 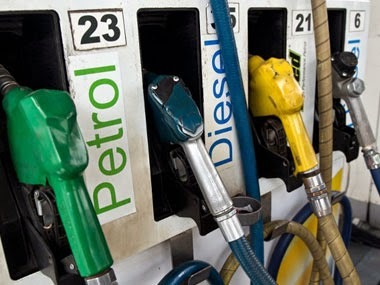 Public sector oil marketing companies announced a hike in diesel and petrol prices with effect from midnight 28 February. The increase in retail selling price of petrol is by Rs 3.18 per litre and Rs 3.09 per litre in diesel. The price revision, the oil companies said has been done on account of steep increase in international prices of both petrol and diesel. There has been a further steep increase in international prices of both petrol and diesel and the rupee-dollar exchange rate has also depreciated slightly since the last price revision. The combined impact of both these factors warrants increase in Retail Selling Prices of both Petrol and Diesel,” said Indian Oil Corporation in a statement. “The movement of prices in international oil market and rupee-dollar exchange rate shall continue to be closely monitored and developing trends of the market will be reflected in future price changes,” the statement added. This is the second successive price hike in the retail selling price of petrol and diesel.